With any campervan, you must decide whether or not you want running water. I decided it was worth having, and wouldn't bee too challenging to implement. 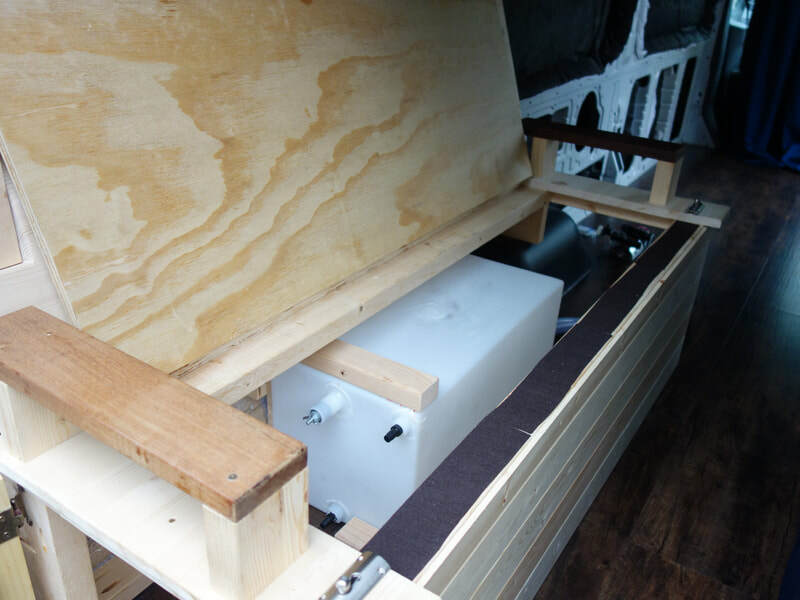 I had already predetermined where I was going to store the water tank, and I built the couch to perfectly fit a 12" by 12" by 24"water tank, which I bought on Amazon. 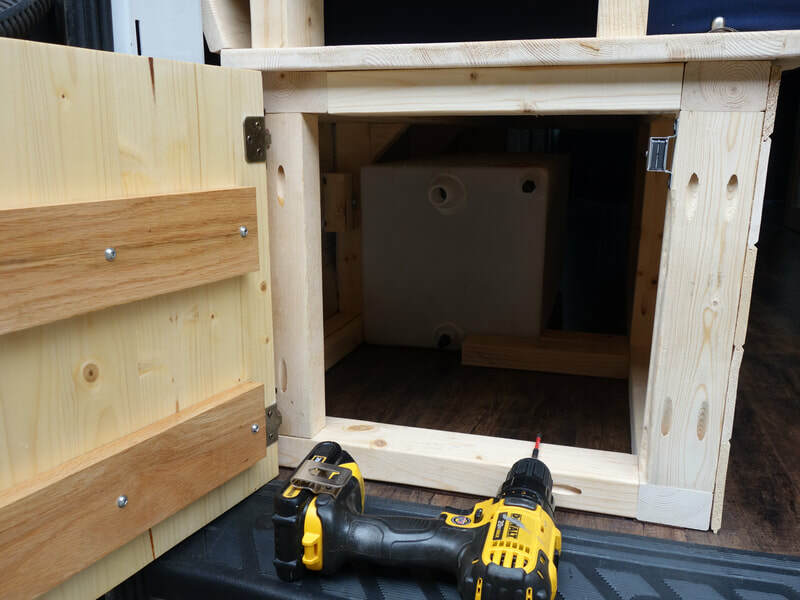 The tank came with pre-made holes for a drain, fill hole, air vent, and outflow. I also had to buy a water pump, and after some research I decided to get the tried and true SHURFLOW 3.0 gallons/minute, 55PSI water pump. This is the perfect size, because it won't empty the tank too fast (if left running constantly, it will take 5 minutes to empty the tank). This is perfect for simple tasks like quickly rinsing dishes, brushing teeth, or filling pots for cooking. 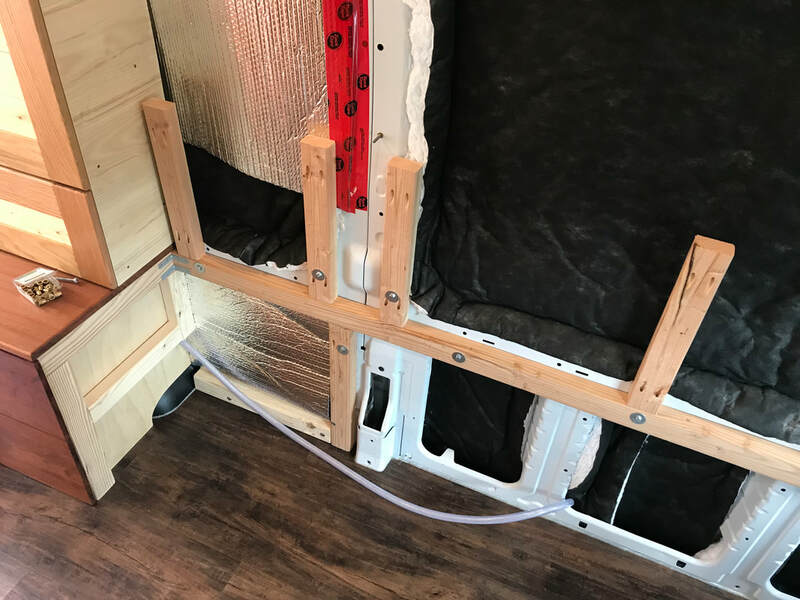 First, I cleared a spot for the water tank under the couch, and secured it in place to prevent it from sliding around with extra short pieces of 2" X 3" studs attached to the existing couch frame. 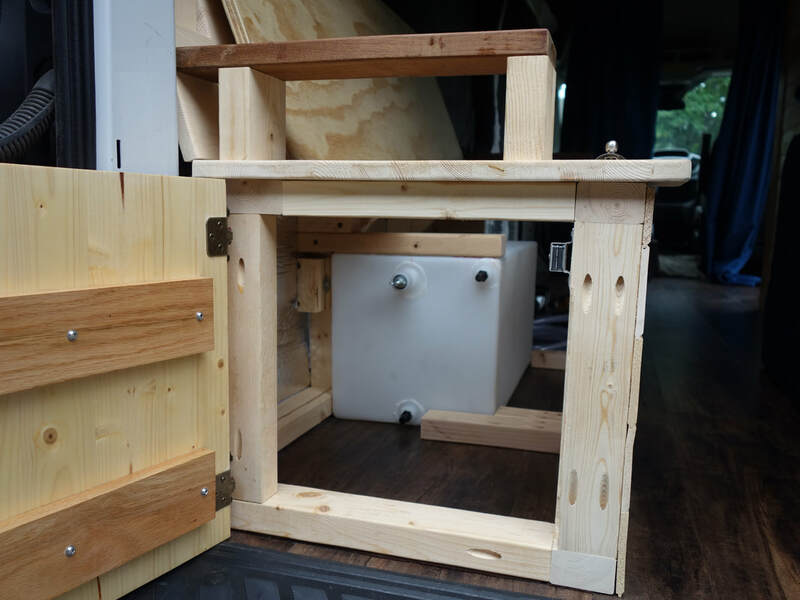 I used the Kreg jig to securely attach them, along all sides of the tank, as well as above it to keep it from bouncing upwards in the event of a large bump on the road. 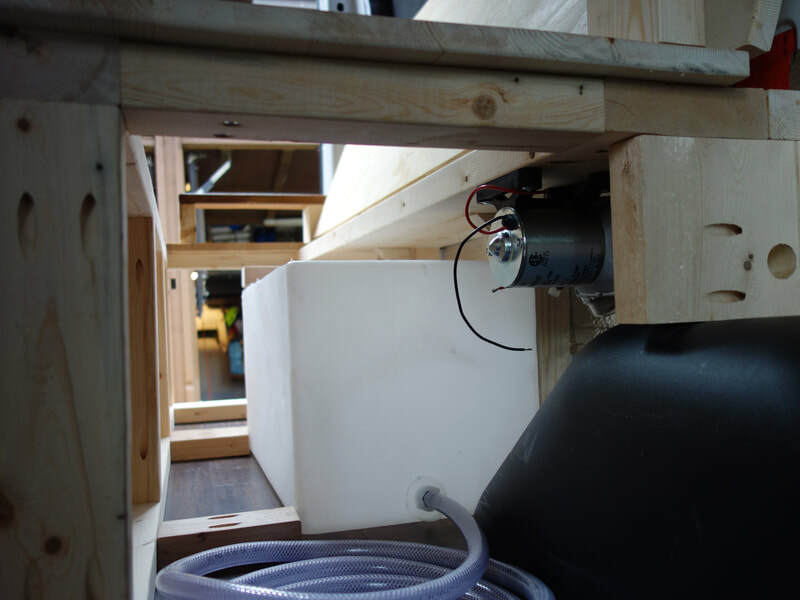 Next, I located a spot on the underside of the horizontal beam that comprises the bottom of the couch to place the water pump. This spot is very close to the tank, allowing for least amount of distance as possible to maximize the pup performance. Because the pump can be mounted in any orientation, this gave me quite a bit of freedom of where to place it. I also purchased the pump strainer designed for this SHURFLOW pump, and it was an easy screw connection on the inflow side of the pump. The tank came with 1/2" threaded fittings with barbed nozzle ends for a water tight seal against the braided hose. These were easily screwed into the pre-fabricated threaded holes in the tank, with some Teflon tape for added seals. It is important not to screw these on too tight because the treads are only plastic! 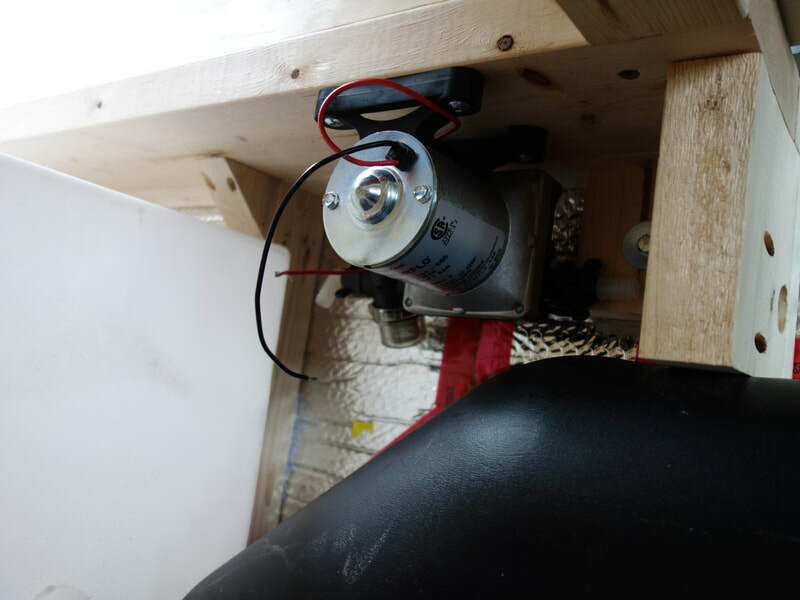 With the barbed fittings screwed onto the tank, I used the 1/2" flexible braided hose, and cut a piece to connect the outflow port of the tank to the pump strainer, pushing the hose over the barbed fittings and clamping with 3/4" pipe clamps. Once the water pump and water tank were securely mounted, and the short 3' hose connecting them was secured and sealed, I drilled a 1" hole with a spade bit through the couch frame directly above the wheel well for the outflow hose to fit through, that will eventually get connected to the faucet once the sink and counter was built. In the photo directly above on the left side, there is a hole on the far right edge just above the wheel well. This is where the outflow hose will be routed. I cut the hose longer than I knew I'd need, and pushed it through the hole and connected it to the outflow valve of the water pump. 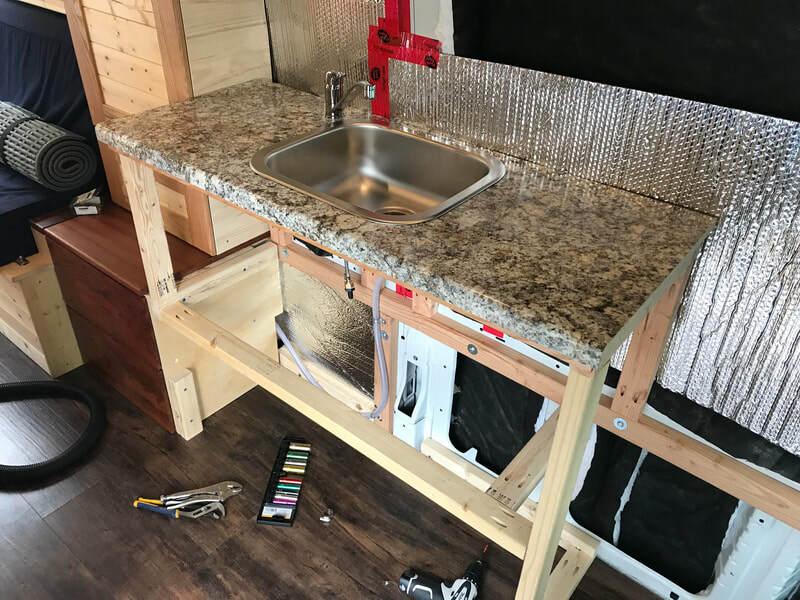 ​A number of months passed before I got the time to build the frame for the counter-top and install the sink and faucet. 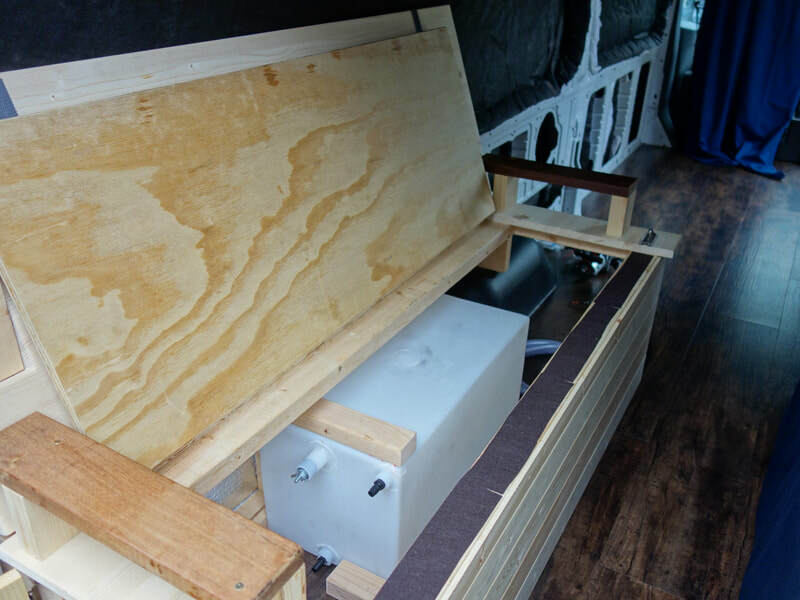 In the meantime after the tank and pump were installed, I built the electrical closet and pantry directly adjacent to the couch (see next articles). 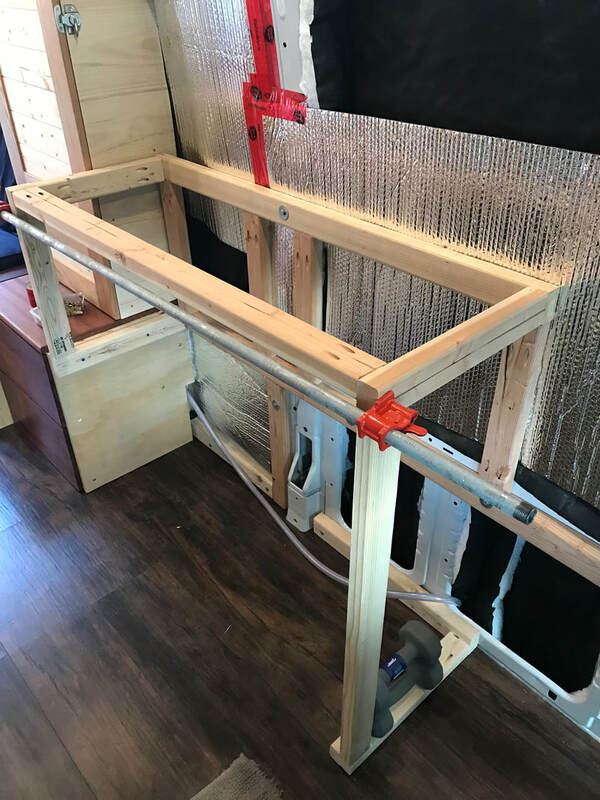 In early October 2018 I was able to build the kitchen counter, and started by securing a long piece of 2" X 3" along the length of the side van wall with the rivet nuts. This piece would act as a perfect anchor for most of the frame. I built down and out from here, precisely measuring additional pieces of 2" X 3" to make a solid and square frame that extended out enough to allow the final Cherry facial boards to be flush with the electrical closet. I had to make extra sure the top of the frame where the counter-top with sit on was perfectly flat and square, so I added wood glue to these joints and clamped in place. 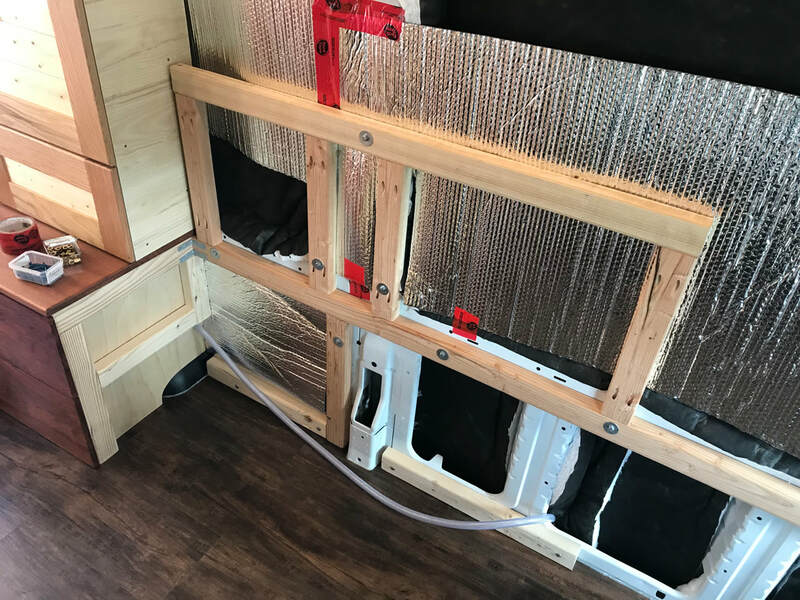 In the first photo below, notice the finished electrical closet (bottom) and pantry (top) on the left edge, with the outflow hose sticking through. 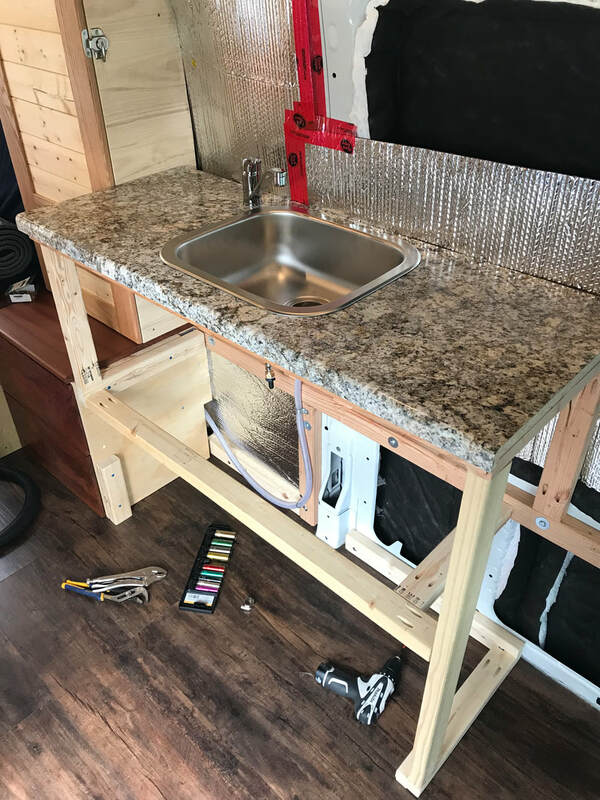 With the frame complete, I was now able to install the counter-top and sink. Using the 4' long piece of pre-fabricated vinyl counter I purchased on the cheap at Lowes, I had to first rip it down to the width needed. The counter came with a built in backsplash, and was an industry standard of about 25" wide. 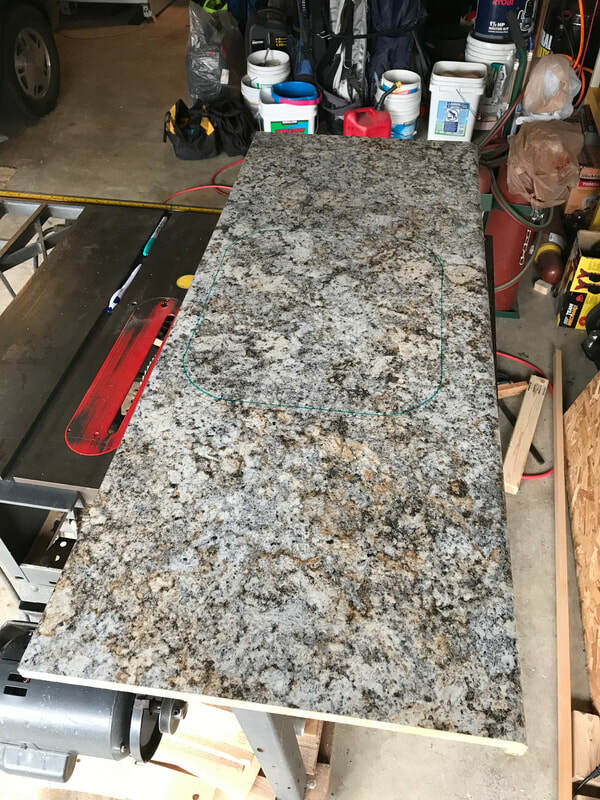 My frame was only about 19" wide, so I used the table saw to cut 6" off the backside, including the non-essential backsplash. I followed the instructions that came with the Ikea sink and marked exactly where I would need to cut the hole for the sink to sit flush with the counter. I decided to center it, rather than offset it. Using a jig saw, I slowly cut out the required shape and test fit the finished counter-top and sink assembly atop the framework. 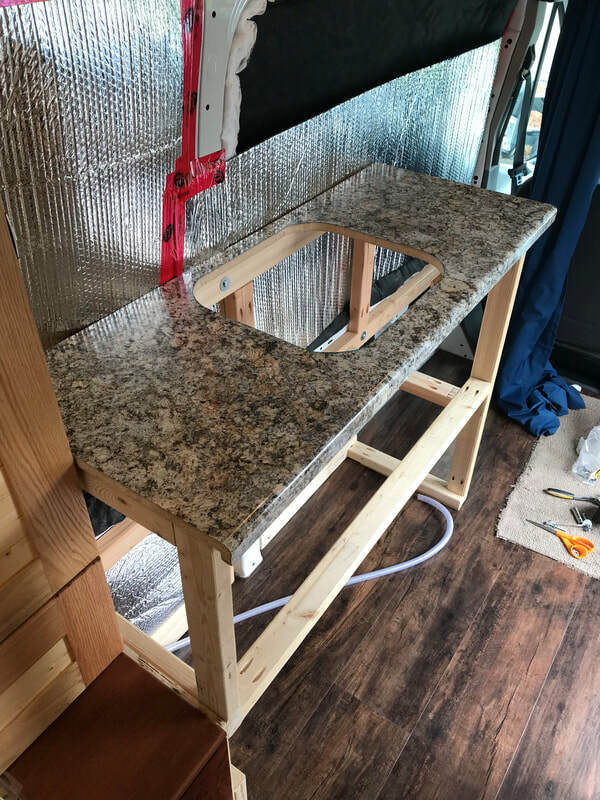 Everything seemed to fit well, so I secured the counter-top to the frame with 90 degree angle metal furniture braces from the underside. Securing the sink to the counter-top involved messing around a lot with the hardware that was included with the sink, but with enough tinkering, I managed to get it to work. Apparently these are standard pieces of hardware that anyone who has worked with sinks before will know how to use, however this was the first sink I've ever installed, so it took a while to figure out. 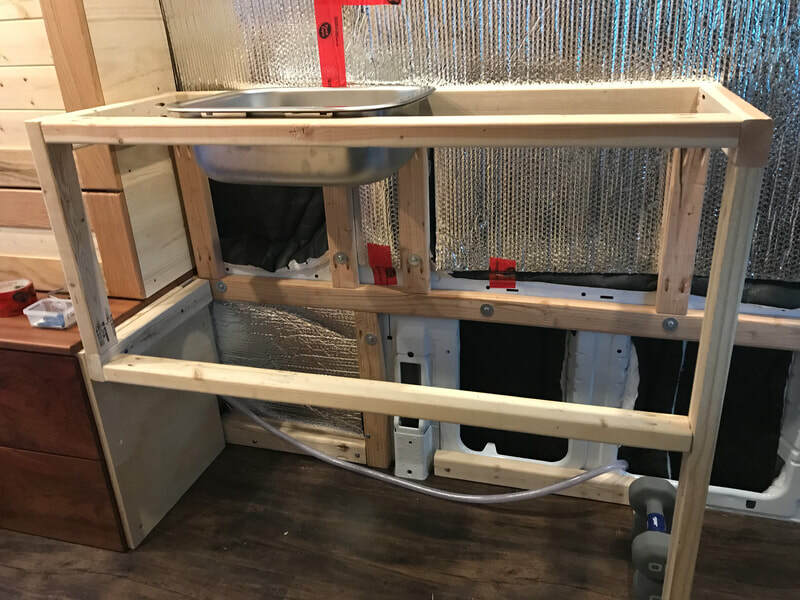 ​The last thing to do was to drill the hole through the counter for the faucet, which was an easy ordeal using a hole saw. I just had to make sure to place the faucet in a spot where the triangular plastic washer that is placed on the underside has a spot to be perfectly flush against the counter without hitting a frame board or the sink. The left corner ended up being the best place. Once the faucet was installed and tightened, I plugged the hot side with a threaded brass plug (since I will only be using cold water) and attached the outflow hose to the cold side of the faucet. This involved cutting the hose to length, and using U shaped brackets to secure it to the frame so it wouldn't jolt around when the water is turned on and off. Before I could even think about testing the whole system, I had to have a proper drainage solution. 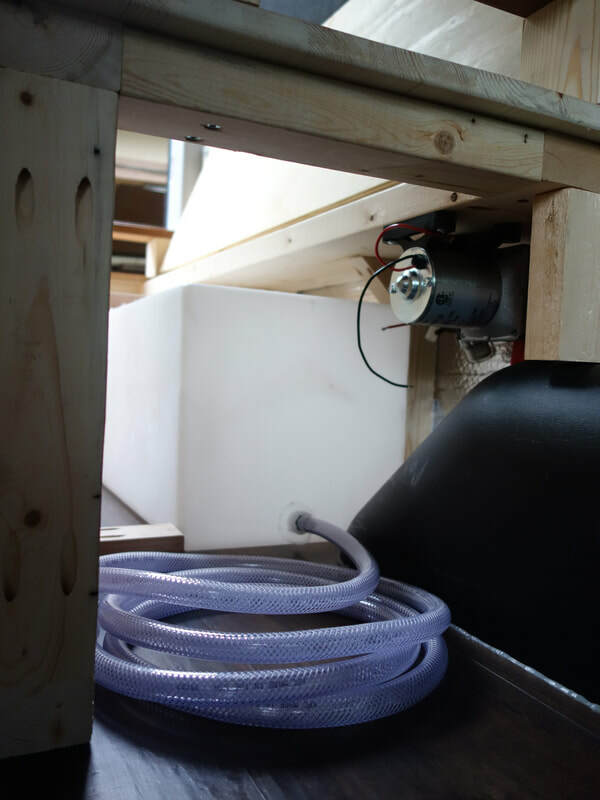 I decided I would have both a grey water tank on board stored underneath the sink, as well as a direct through-the-floor drain. 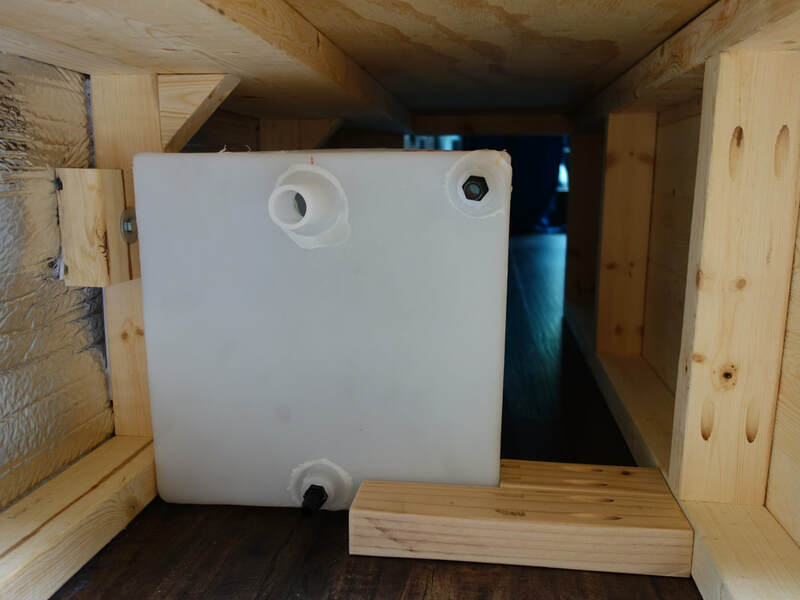 This would allow me to utilize the grey water tank when I needed to be environmentally conscious, or simply drain through the floor when just water was draining out, and would not have an effect on the environment.